When are deleted questions counted among tagged questions? When this was pointed out on meta.MO, one user suggested this explanation in a comment: "You can see the other question in the RSS feed for the tag. It got some downvotes and was removed by the author, but not before being included in the feed, which is what gets counted." Indeed, when I checked the RSS feed, I was indeed able to find another question there. It seems to be deleted - so the previous link will work for users with 10k+ on that particular site - but at the moment the question can be still seen in the Google cache. Is the interpretation in the comment correct? Are questions counted when they are included in the RSS feed? Would the information be eventually corrected? How long would it probably take? There is also another question mentioning deleted questions influencing number of tagged questions: Retagging deleted questions should not affect tag question counts However, in that case it was about number shown in the list of tags, so I think it is different from what I am asking. Screenshot showing all questions tagged topology - together with the incorrect number. 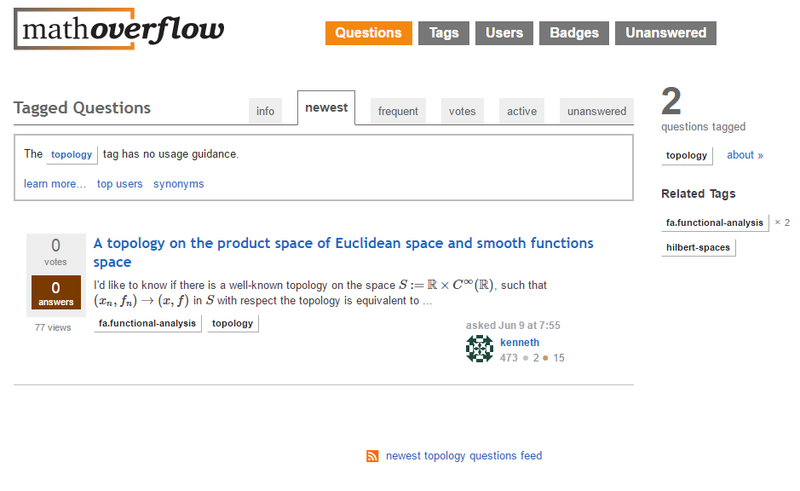 Screenshot showing the tag info and list of tags - where the number of question is correct. EDIT: A few hours later the same page correctly displays 1 question. It was confirmed by 10k+ user that the deleted question has not been retagged. So I guess that the most likely explanation is to blame caching. The list of questions is cached and doesn't update immediately when things get deleted, moved around, or asked. However, we don't want to display deleted questions to users so, when showing the list to you, the system does a quick check on all the questions cached for that page and, if deleted, doesn't show that particular question in the list. This doesn't update the number at the right, nor does it fill in the empty space (if applicable). So if you were viewing page 1 at 50 posts per page, and it contained a now-deleted post, you would only see 49 results on that page because one got hidden. Eventually when that particular cache refreshes, the deleted post will no longer be a part of the cache and everything will update properly, including the number at the right. Not the answer you're looking for? Browse other questions tagged support tags deleted-questions feed caching . Any way to get an RSS feed of 'newest' tagged questions?